Grace Darling (November 24, 1815 – October 20, 1842) is a storied English Victorian heroine, on the strength of a celebrated maritime rescue in 1838. Grace was born in 1815 at Bamburgh in Northumberland, and spent her youth in two lighthouses of which her father was the keeper. In the early hours of September 7, 1838, Grace, looking from an upstairs window of the Longstone Lighthouse on the Farne Islands, spotted the ship, SS Forfarshire, which ran aground on Big Harcar only a few hundred yards away. Knowing that the weather was too rough for the lifeboat to put out from the shore, Grace and her father rowed a small fishing boat across to the island and rescued nine cold, wet, frightened survivors, bringing them all safely back to the lighthouse. In her own short lifetime, Grace's achievement was celebrated, and several fictionalized depictions propagated the Grace Darling legend, such as Grace Darling, or the Maid of the Isles by Jerrold Vernon (1839), which gave birth to the legend of "the girl with windswept hair." Her deed was committed to verse by William Wordsworth in his poem Grace Darling (1843). A lifeboat with her name was presented to Holy Island. Darling was born on November 24, 1815, in Bamburgh, Northumberland in her Grandfather's cottage; located on the Northeast coast of England near Scotland. She was the daughter of William and Thomasin Darling. 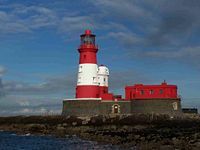 Her father was the Principal Keeper of the Longstone Lighthouse on the Farne Islands. She was the fourth daughter and seventh child of nine children. Darling was home schooled as schools were not close. She spent her short life on the island with her parents. Darling and her father were awakened abruptly early on the morning of September 7, 1838. The steamship Forfarshire had run ashore and broken in two in the North Sea, on the rocks by the lighthouse. The steamship, bound from Hull to Dundee had 63 passengers on board, 43 of those drowned. The wreck was observed from the lighthouse; the Darlings without thought for their own safety started toward the wreck to try and reach the survivors. By a combination of daring, strength, and skill, the father and daughter reached the wreck in their flat-bottomed fishing boat and brought back four men and a woman to the lighthouse. Darling and two of the rescued men then returned to the wreck and rescued the four remaining survivors. The survivors, crewmen and passengers, remained on Longstone Lighthouse for three days until returning to the mainland when the storm subsided. Darling was a shy and reserved child, completely unprepared for the onslaught on praise and admiration she received after the newspaper heard of her heroics. Her story touched people from all walks of life. Queen Victoria even wrote Darling praising her conduct and awarded her 50 pounds sterling for her courageous actions. Darling received countless letters requesting locks of her hair and scraps of the dress she wore during the rescue. Her family soon worried she would lose all her hair as she obliged all her requests. The Darlings had seven portraits painted of themselves and were unable to comply to the number of further requests. Before long depictions of Darlings heroic act began appearing on trinkets, tea-caddies, plates, postcards, and chocolate boxes. These items sent her story even farther and new admirers were created around the country. She died of tuberculosis, unmarried, in 1842. She is buried with her father and mother in a modest grave in St Aidan's churchyard, Bamburgh, where a nearby elaborate cenotaph commemorates her life. A plain stone monument to her was erected in St Cuthbert's Chapel on Great Farne Island in 1848. Even in her lifetime, Grace's achievement was celebrated, and she received a large financial reward in addition to the plaudits of the nation. A number of fictionalized depictions propagated the Grace Darling legend, such as Grace Darling, or the Maid of the Isles by Jerrold Vernon (1839), which gave birth to the legend of "the girl with windswept hair." Her deed was committed to verse by William Wordsworth in his poem Grace Darling (1843). A lifeboat with her name was presented to Holy Island. One of the series of Victorian paintings by William Bell Scott at Wallington Hall in Northumberland depicts her rescue. At Bamburgh there is a museum dedicated to her achievements and the seafaring life of the region. It was suggested by Richard Armstrong in his 1965 biography Grace Darling: Maid and Myth that she may have suffered from a cleft lip. He is the only biographer to put forward this theory, which has been strongly disputed by other experts. The Royal National Lifeboat Institution Mersey class lifeboat at Seahouses bears the name Grace Darling. This page was last modified on 8 July 2017, at 20:03.